1946 Began martial arts training in Escrima & Combat Judo. 1958 Began studying Isshin-ryu from Tatsuo Shimabuku on Okinawa. 1959 Gave first U.S.M.C. hand-to-hand combat class. 1960 Returned to Alaska and opened a dojo in Anchorage. 1961 Designed the first and only Tatsuo Shimabuku approved Isshin-ryu patch. 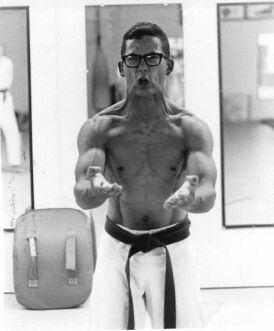 1961 Studied Hindiandi Gung Fu from Kang Kaneshiro on Okinawa. 1962 Studied Shorin-ryu from Segin Nagamine on Okinawa. 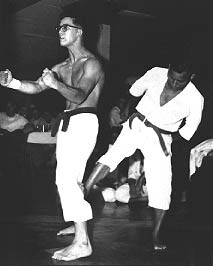 1963 Studied Goju-ryu from Kinei Nakasone & Masanobu Shinjo on Okinawa. 1975 Studied Kobudo in Ryu Kon Kai from Kotaro Iha on Okinawa. 1975 Studied Uechi-ryu from Kosuke Yonamine on Okinawa. 1981 Retired from U.S.M.C. as a MSgt. with 24 years of service. 1983 Made three Escrima videos for Panther Production Videos which are still available. 1986 Published author in Black Belt Magazine & Wholeheart News. 1987 Black Belt Magazine Co-instructor of the year with Ray Dalke. 1987-93 Body Management Coach of the San Diego Chargers (NFL) Football Team. 1992 Designed Fighting Knife (FleshEater) for knife maker, Jim Hammond. 1994 Interviewed by CNN as knife expert on O.J. Simpson case. 1994 FleshEater knife is mentioned in the novel THE RECKONING by James Byron Huggins. 1994-97 Conducted 4 Okinawan cultural martial arts tours. 1996 Established use of the vertical punch at U.S.M.C. Recruit Depot in San Diego, CA. 1996 Commemorated 50th anniversary in the martial arts. 1997 Marine Corps adopts rifle, bayonet/knife and close combat training. To view articles written by Advincula Sensei, click here.